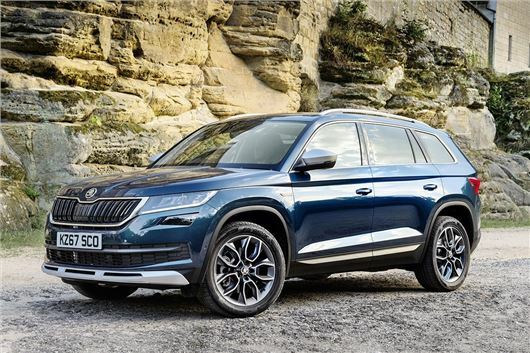 Skoda has introduced the Kodiaq Scout, which gets a 4x4 system as standard, along with more rugged styling. A choice of 1.4 TSI, 2.0 TSI and 2.0 TDI engines is offered and prices start at £32,330. Orders are open now. Styling changes for the Scout include off road front and rear bumpers finished in silver, with 19-inch alloy wheels and Scout badges. There’s also an engine guard and underbody stone guard to provide some extra protection when tackling rough tracks. The 4x4 system includes an off-road driving mode, which adapts the chassis, engine and brakes to better suit rough terrain, plus there’s a hill-descent control system that automatically maintains a safe speed on steep slopes. Inside, the Kodiaq Scout features Alcantara upholstery, wood inlays and aluminium pedals. Seven seats are fitted as standard. The entry-level engine is a 1.4 TSI with 150PS, available with either a six-speed manual or seven-speed DSG. The 150PS 1.6 TDI is also available with either a manual or automatic transmission, while the 180PS 2.0 TSI and 190PS 2.0 TDI come with a DSG gearbox as standard. A series of recent model launches from the VW stable featuring ridiculously high prices for their products has totally turned me off all their brands. I thought Skoda was supposed to signify value for money......obviously not any more with these premium prices.